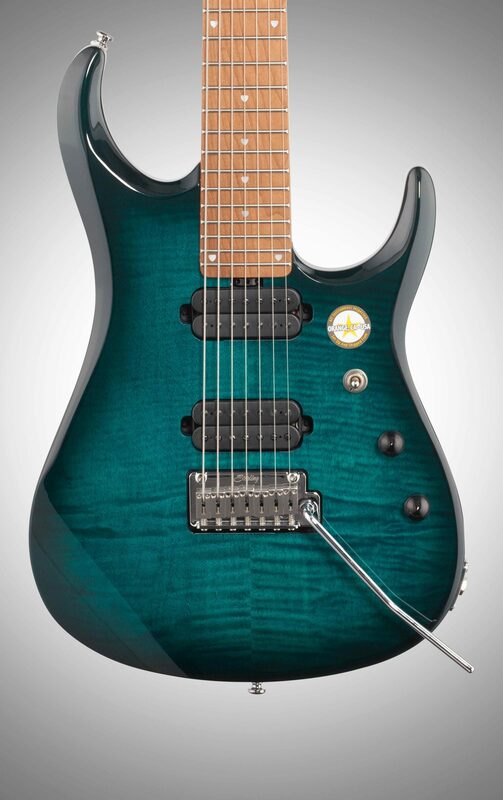 The Sterling by Music Man JP157, based on the seven-string version of the Ernie Ball Music Man JP15, features sleek styling, and seductively good looks with its highly figured, Flame Maple top. 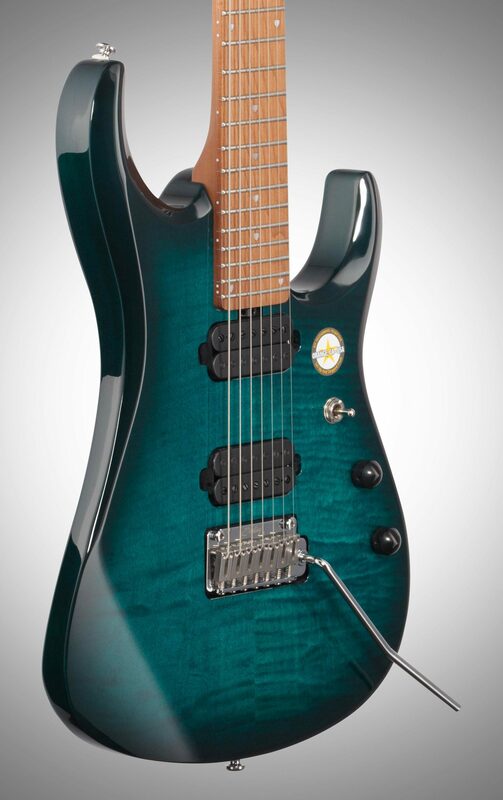 JP157 features a gorgeous Roasted Maple neck and fretboard, which not only give this guitar a striking appearance, but also an incredibly responsive feel. 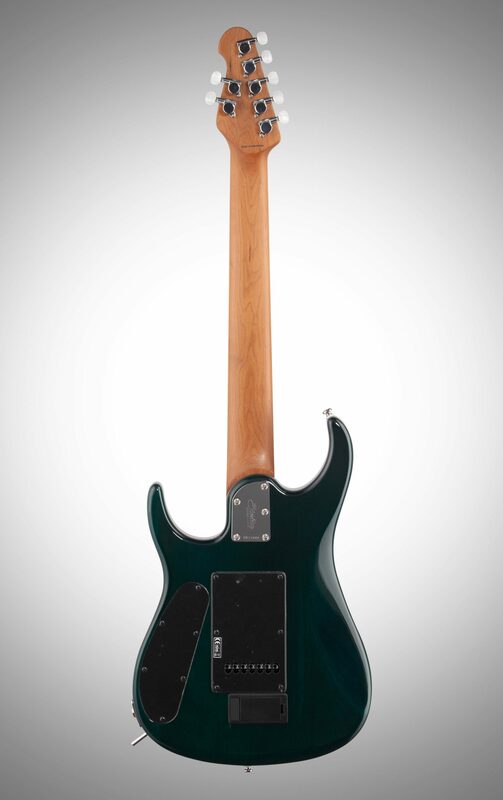 The Roasted Maple neck undergoes a very specialized kiln drying process which involves heating the wood to a specific temperature, or "Roasting" it, as the name implies. This removes excess moisture from the wood, which makes it stronger, more stable, lighter in weight, and, less susceptible to humidity changes. It also gives the player one of the most amazing feels in a neck. 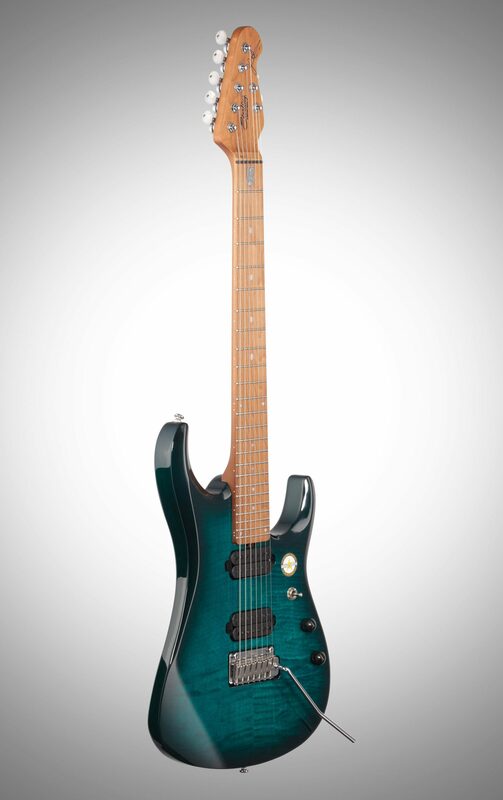 Topping the Roasted Maple neck is a 16" radius, 24 fret Roasted Maple neck with "Shield" style inlays, as well as John's signature "JP Shield" logo, which is inlaid at the first fret. 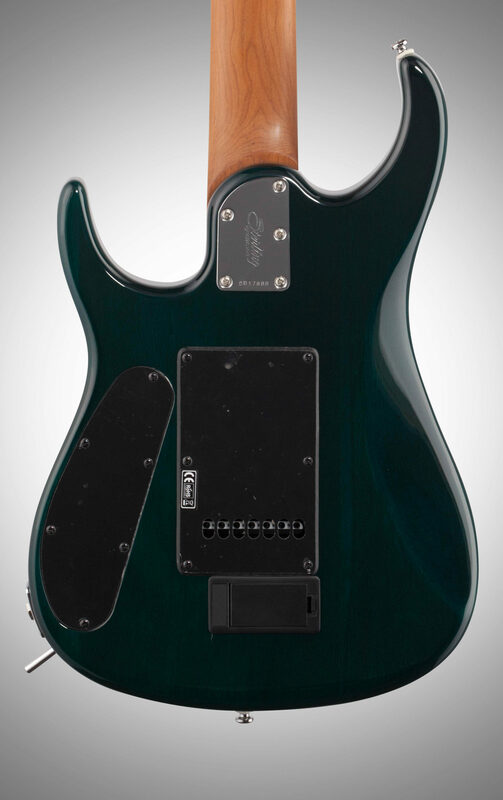 Ergonomically arranged in-line controls include a 3-position pickup selector, Volume, and Tone VR controls. Additionally, JP157 features an Active "push-push" 12dB circuit boost on the Volume control, allowing the player ultimate soloing power at their fingertips. This Active Circuit is powered by a 9V battery that loads into an easily accessed compartment on the rear of the instrument, and requires no tools, making battery changes user friendly and quick. Accurate intonation, smooth operation and excellent tuning stability come courtesy of the combination of Locking Tuning Machines and the Sterling by Music Man designed "Modern Tremolo". This premium, full floating tremolo system is featured on most John Petrucci Signature Series instruments, and allows for full dives, 2 step pulls, and is exceptionally responsive to flutter effects, all while maintaining accurate tuning. 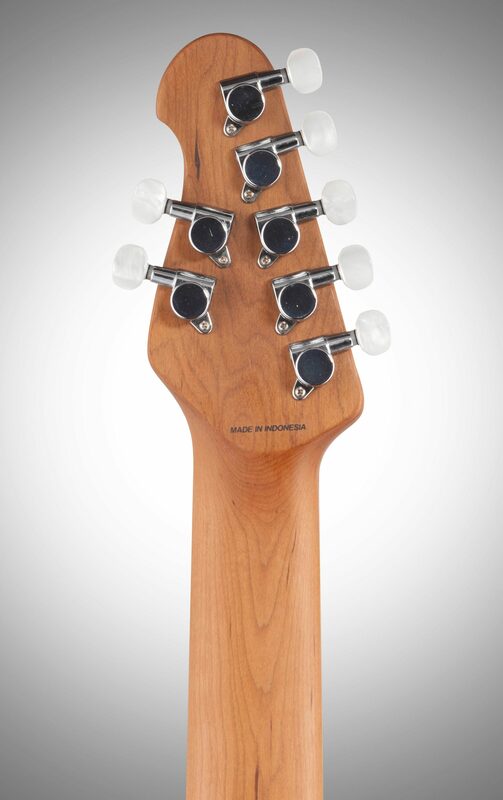 The Locking Tuning machines are arranged in a 5+2 manner on the headstock, giving positive, in line string pull over the nut. String changes are easy with a slight turn of the locking wheel mechanism located on the rear of each tuning machine. 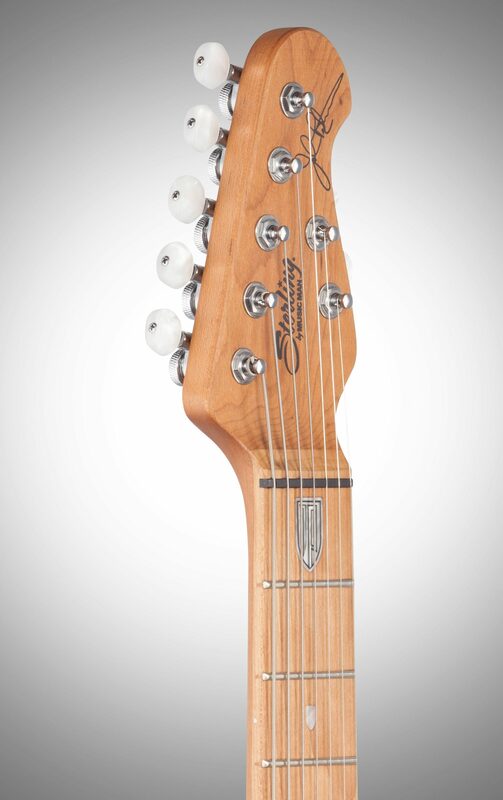 Johns' signature is also proudly featured on the face of the headstock. 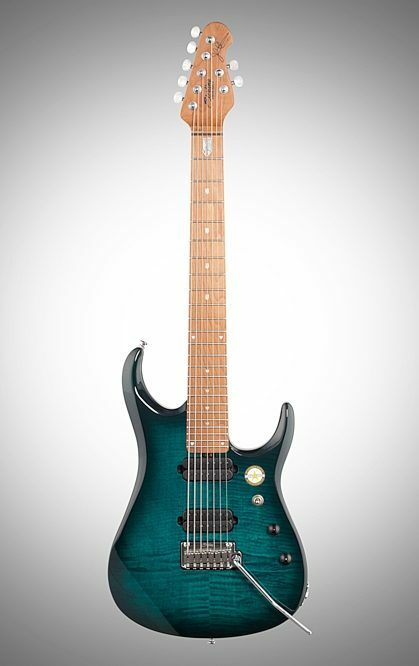 The Sterling by Music Man JP157 is without equal in its price point, make this a seven-string axe to wield with power. Overall: Super impressed with the quality of this guitar I’ve read some contradicting reviews online but the one I received was awesome.I had to give it a quick set up out of the box but other than that it plays like a dream!